BRIGHTON — Pemayetv Emhakv Charter School students were honored for their academic achievement during the first nine weeks at an awards ceremony held at the Charter School on Oct. 31. 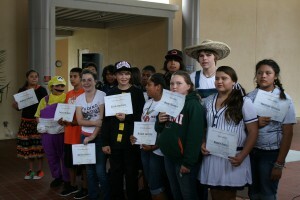 Students, some dressed in costume to celebrate Halloween, received awards for their accomplishments in their Creek, Seminole history and arts and crafts classes. They also received awards for their core curriculum in their regular classrooms. “I don’t usually dress this way, so don’t expect to see me like this next nine weeks,” Principal Brian Greseth dressed as a Viking joked. Parents, grandparents and friends attended the awards ceremony to support the students and capture the moment with pictures. The program began with students receiving their culture awards from Creek language teacher Myra Gopher. The Culture Department presented awards including: Best Creek Speaker and Most Improved. Following culture, students were awarded certificates for effort, citizenship and improvement. Fifty-one students between third and eighth grade received the Bronze Award with a GPA of 3.0-3.4. Twenty-six students earned the Silver Award with a GPA of 3.5-3.9 while 12 students received straight As earning the Gold Award with a 4.0 GPA. The Charter School has added new elements into their classroom curriculum to help foster the students’ academic excellence. “We are using several different assessments to show us when students are mastering specific skills,” Greseth said. A monitored independent reading time was implemented this year by the Reading Leadership Team. Each day, students are given 20 minutes of monitored reading to help increase fluency, vocabulary and comprehension. For kindergartner Kateri Smith, the new curriculum addition has paid off. Smith was the only kindergartner to enter into the 100s Club in the first nine weeks. Teachers and faculty will continue to raise the bar for students, Gran said, and they hope in the next nine weeks, the number of award recipients will increase even more.